The Llangollen Canal is considered the most beautiful waterway in the country. It includes the famous Pontcysyllte Aqueduct, one of the wonders of the canals, and is noted for its many lift bridges. The full length of the canal is a week's cruise full of contrasts, from the staircase locks at Grindley Brook to Shropshire's mini lakes around Ellesmere, from the rolling plains of Cheshire to the hills and mountain scenery around Llangollen. From the eastern end of the canal cruise through rural scenery past Wrenbury village to Grindley Brook and the market town of Whitchurch. Traverse the remote Whixall Moss peat bog into the little known Shropshire Lake District and past some of its seven Meres to the unspoilt small country town of Ellesmere. After Ellesmere the canal continues past farmland and open country to Chirk and through the Chirk Tunnel, with Chirk Castle close by. Cross from England into Wales over the Chirk Aqueduct then cruise on to Thomas Telford's breathtaking Pontcysyllte Aqueduct. 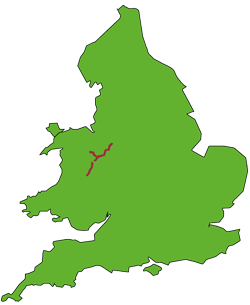 It carries the canal in an iron trough 1,000 feet across the River Dee at a height of 120 feet. The canal hugs the steep sides of the Dee valley with superb panoramic views before entering Llangollen on a high embankment. Pleasant week, and a favourite with both new and experienced canal boaters. For those seeking a gentle week, the 30 mile long canal section between Llangollen and Whitchurch includes only 2 locks. Llangollen: interesting town with restaurants, pubs, and shops, famous for its International Music Eisteddfod held annually in July. Horse drawn trip boat to the start of the canal at the Horseshoe Falls. Steam railway, motor museum. The whole canal length makes a good one week holiday. Mooring close to Llangollen has improved with the construction of a new marina moorings. Mid-week and weekend breaks are available from all Canal Holidays Bases on the Llangollen Canal except Base 22. Historic Chester may be reached in a midweek break from Base 19 or on a short break from Base 18. In a two week trip the Llangollen Canal can be combined with the Four Counties or Cheshire Rings, or can be extended with a visit to Chester, famous for its city walls and historic Rows. Read what some of our previous clients say about the Llangollen Canal. "Ellesmere port is a pretty little town with a good food shops and pubs. We'd recommend The Woolpack in Llangollen - it's a very pretty and somewhat eclectic restaurant that looks out over the river. It also had a decent selection of wines." "Wish we were rich...we'd come back and do our Welsh trip all over again. Thanks for a fine time. I won't soon forget when your man jumped off the boat at the bridge...leaving me ALONE AT THE HELM!!" "Our first narrowboat holiday, but the combination of an exciting route and a well fitted boat made it something to be repeated." "The four of us, ranging in age from 53 to 73, all had a marvellous 4 days. Thanks for your help in organising it." "We voyaged from Chirk to Llangollen to Nantwich and back to Chirk. The route was diverse and characterised by magnificent scenery as well as breathtaking historical canal works. We recorded 32 species of birds. We spent nights alternatively in towns and in rural byways. When they wished, the youngsters would jump ashore and walk or run the towpath, usually reboarding at a bridge site along the way. Other travellers we met were friendly and relaxed." "I think it was one of the best holidays I've ever had and I could've stayed for another four weeks. My partner feels the same way. The boat was clean, reliable and stocked with the groceries that we requested. A friendly chap showed us the ins-and-outs of the boat pretty succinctly and off we went. We actually fell in love with the boat and were very sad to leave her behind." "Most of the route exceeded our expectations. We cynically expected that the best was shown in the brochures but learned that the whole route was full of nice scenery with new surprises at each bend. The Llangollen was fanatastic." "The Llangollen Canal and Montgomery Canal were an outstanding experience. Aside from the natural beauty, the small number of locks was attractive to a wife to whom such things do not appeal." "The boat was in perfect condition, perfectly clean, the galley well supplied, and instructions were clear and accurate. The young lady who briefed us was polite and professional and patient. The free parking was a major plus and the Chirk Castle setting another plus.